For those with school age children, the phrase “back to school” reminds them of everything they have to deal with in the early days of the new school year: new clothes, new schedules, new teachers and homework, football games, and maybe a little anxiety about it all. For the rest of us, this time of year holds the promise of cooler weather ahead and for Disney fans, lower crowds at the parks. Generally, school holidays are the busiest times at the parks. If you can avoid these times (summer, Spring and Fall break, and Christmas break) you’ll be rewarded with shorter lines and, usually, resort hotel discounts. Fall is a great time of year at Walt Disney World. Depending on your travel dates, you can experience Mickey’s Not So Scary Halloween Party, Festival of the Masters, Epcot International Food & Wine Festival, and the everyday magic of not-so-crowded parks. Mickey’s Not So Scary Halloween Party: Trick or treat with your favorite Disney characters. Held in the Magic Kingdom on about 20 nights during the fall, Mickey's Not So Scary Halloween Party (MNSSHP) is fun for all ages. The park is transformed into a slightly spookier version of itself. In addition to candy, you'll be treated to the very special "Boo to You" parade and Happy HalloWishes fireworks and other special surprises. Separate admission is required and the cost ranges from about $53 to $65 per adult, depending on the day and if you qualify for any discounts. Kids tickets are $47-$58. My brother Chris and I will be attending this year's party and blogging live from the event on October 26, 2010. Downtown Disney is home to this annual art festival which attracts over 150 national and local artists. Unique to the event is the showcase of chalk artists. It's Disney, so there will also be great food, music, and children's activities. One of our Minnie Moms is attending this year's festival and I look forward to her report. Epcot International Food & Wine Festival: The Epcot International Food & Wine Festival is one of the best events hosted by Walt Disney World. This year's festival is appropriately titled, "Celebrating 15 Years of Delicious Discoveries." The 2010 event begins on October 1 and ends on November 14. The majority of the food marketplaces and demonstrations are found around World Showcase Lagoon. This year there will be 27 International Marketplaces selling beverages of all types and small plates of all sorts of food. There is not a separate admission fee for the festival; it is included with your Epcot park admission. Some seminars and demonstrations are free and others at an additional cost. There are a phenomenal number of events held during the 7 week festival. I encourage you to browse through the Festival Guide to see what is offered during your visit. It's a wonderful opportunity to sample a cuisine that may not be readily available to you at home. For more information on the festival, check out our EIF&WF Research Center. To those of you who have found your way here via the Back to School Blog tour, welcome! Please leave a comment and check out a few pages. Hi Heather. Welcome and thank you! I am also friends with Kelly. She's helping me with my next WDW vacation. Hi! Im visiting from the Back to School Blog Tour! I love your blog. I am hoping to take my little ones to Disney Land in a couple of years and will have to read more from your blog. Im coming from the back to school blog from livingmymoment.com! I was to Disney when I was 7 or 8 and would love to take my own son there someday!! 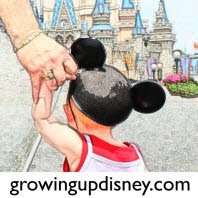 I am part of the tour, and happy to have found your blog, we are becoming and all things disney fam and will definitively benefit from your blog. thanks for the spooktacular tip, it is noted, hopefully we will meet then, are you in SoFla? Thanks for being part of the Back-to-School Blog Tour! Wow, the Mickey’s Not So Scary Halloween Party sounds like so much fun! Our family just went to Disney Land this summer and we had such a blast! Next time we'll have to check out Disney World. Thanks everyone for your comments!!! I am loving meeting new friends through the Back to School Blog tour! Shop with Me Mama, Kelly is a great Disney travel agent. Click on the Halloween image to the right to be taken to her site. Holly, thanks for co-hosting the event! I am stopping over from the Back to School Blog Tour. I love everything Disney! I will be stopping back because we are hoping to go back to Disney World next summer. Hope you will stop by my blog at http//www.littleladybugdesignsblog.com I am hosting a giveaway! Fun! I love Disney! Went to DisneyWorld 6 months into dating and we just took our older daughter for her first trip (she's 4) this spring! Oh, I also went to Disneyland with my mom and my sister just before I got pregnant with said older daughter!! Epcot is my favorite and if I could I would love to go back for the Food and Wine Festival. I'm sure that is amazing. Thanks so much for being a part of the Back To School Blog Tour!